Councillors have backed calls for Aberdeenshire Council to object to a new 26-turbine windfarm near the Cairngorms National Park. Members of Kincardine and Mearns Area Committee supported recommendations from the local authority to voice its objection to the 104 mega-watt scheme proposed for the Fasque and Glendye Estates. If the Marr Area Committee also objects to the plans when it meets on Tuesday of next week, it will pave the way for the council’s infrastructure services committee to make a formal objection to the Scottish Government. Coriolis Energy wants to install the turbines and associated infrastructure on the estates north of Edzell. 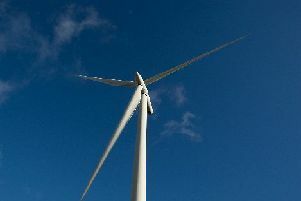 But the area committee heard on Tuesday that the local authority considers that the “significant environmental effects” in terms of landscape and visual amenity, are sufficient to outweigh the benefits of the scheme to contribute towards meeting Scotland’s renewable energy production. Councillors also heard that the Scottish Government has been consulted alongside other stakeholders including Angus Council, Cairngorms National Park, Scottish Natural Heritage and SEPA. Under the scheme, which was first unveiled back in 2016, 26 three-bladed turbines would be installed across 1,500 hectares – each with a maximum height of 149.9m to blade tip – and having an electrical capacity of around 4MW. That will generate an anticipated 104MW across the development which could have a 30-year lifespan. But the development is facing a raft of additional objections. The Ministry of Defence has cited “unacceptable interference” on the Air Defence radar at RRH Buchan as their reason. SEPA has objected to the proposal owing to the lack of information on peat avoidance and reuse, existing groundwater abstractions and Groundwater Dependant Terrestrial Ecosystems. The John Muir Trust has also objected on the grounds of the adverse visual impacts and cumulative impacts of the development around Cairngorm National Park.